Another holiday season, another shopping list with only one guy on it (Hi Dad!). 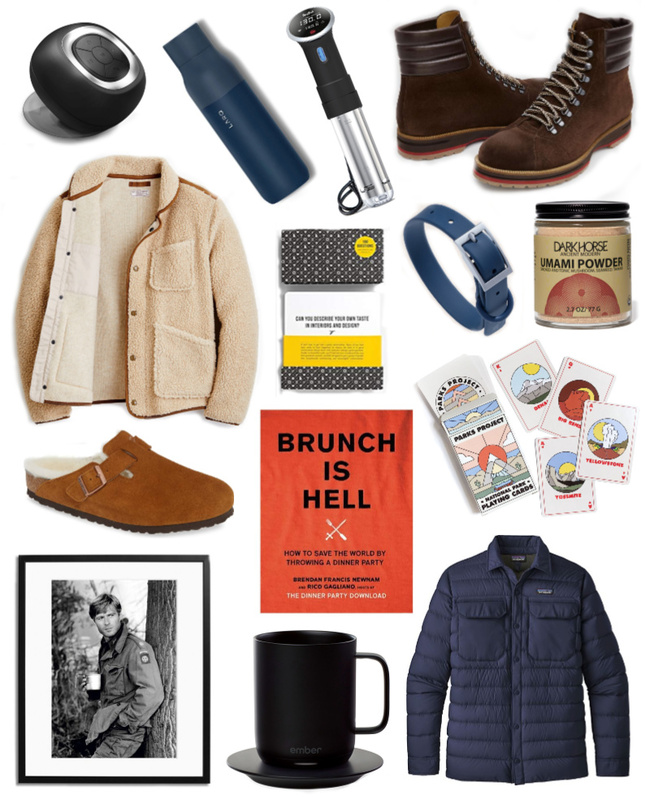 But, gift guides aren't just about me, obviously. You guys have brothers, boyfriends, best friends or maybe even grandfathers you're shopping for. As uncomplicated as some men claim to be, they sure can be hard to shop for, right? The picks this year are crowd-pleasers. There are gadgets, art prints, games, fancy boots and slippers, plus a few fun things for the kitchen and his closet. Wallace & Barnes Sherpa Coat, $148: What can I say? Every design element of this sherpa jacket pleases me. The leather piping, the slanted pockets, the shawl collar. The price point is perfect for gifting and it's really a piece that works for guys of all ages, too. Patagonia Silent Down Shirt, $229: I am a little obsessed with down shirt jackets right now, and I can't quite tell you why, except that they just seem so cool and practical! He could wear this open as a jacket over his favorite sweater, or snap it up and wear it under a heavier coat for an extra-warm and extra-stylish winter 'fit. **Also, I can't resist pointing you to another Patagonia jacket I'm over the moon for—this denim jacket ($199) that has a cool work coat design that's rugged and sophisticated and I can't get enough okay bye. Parks Project Minimalist Playing Cards, $14: Oh gosh, it this any surprise? I find a few decks of cards to include in my gift guides each year because I just think they make a great gift for anyone—and a cozy night with wine and a few rounds of Gin Rummy is the best. LARQ Self-Cleaning Water Bottle, $95: I've seen a few bloggers talking about this "smart" water bottle on Instagram—and it looks really nifty. It cleans itself and won't ever get that bad water bottle smell... Which makes it a great gift for a guy who is a little bit lazy with the dishes but does his due diligence at the gym. Brunch Is Hell: How To Save The World By Throwing a Dinner Party, $17: Nights in over nights out! I love dinner parties more and more these days, especially when you get to bring together different groups of friends and obviously, drink a lot of wine. If you want to encourage a guy you know with a great apartment or house just begging for guests—get him this! Sharply Mason Crewneck Henley, $64: It's not pictured, but I wanted to give a shoutout to a Seattle-based company, founded by family friends! They make amazingly soft menswear, and if you've read any of my stories for Style Girlfriend, you know I stan an henley, always. The School of Life 100 Questions Cards, $30: Again, I love a night in! Encourage interesting and insightful conversations over holiday dinners with these question prompts. Ember Temperature-Control Mug, $80: If you've got dudes on your list who love tech but also love their tea or coffee—I think this is a gift they'll find fun and useful. Using an app on your phone, you can control the temperature of the liquid inside for as long as you like! No more cold coffee you forgot about on the counter for 20 minutes! Dark Horse Organics Umami Powder, $17: No-brainer herbs and spices are always fun for those who love cooking. This umami powder can be sprinkled on vegetables and poultry, added to soups—you name it, you can probably umami it. M. Gemi Zolla Boots, $378: Ah, my love for M. Gemi truly knows no bounds. If you're looking for a splurge gift for a guy you love, dress up his feet in these rugged-meets-sophisticated suede hiking (well, hiking-inspired) boots. Sonic Editions Framed Photos, $299 and up: Another splurge—I love all the vintage photos you can buy (already framed) from Sonic Editions. If Robert Redford isn't his thing, there are scenic shots of L.A. and New York, epic images of Jimi Hendrix and Muhammad Ali, and more. Anova Sous Vide, $129: This was a suggestion from one of my best guy friends, who has and absolutely loves his sous vide. He says it's given him way more confidence and the kitchen and gets him and his girlfriend to cook at home more frequently. Nice! Birkenstock Shearling-Lined Slip-On, $170: Okay don't @ me on this—I don't want to hear it. I'm not saying guys should be wearing these all over town. But I'm saying the make great around-the-house slippers that can also dash outside real quick to let the dog out, get the paper or take all the holiday wrapping paper out to the recycling bin. Wild One Dog Collar, $45: Getting something for your man's best friend is a sure way to get a little farther into your man's heart. Wild One makes really chic dog accessories and necessities in muted shades of navy, tan, pink and white... And if you're feeling a little more splurge-y, why not spring for the whole matching Walk Kit ($105)? exact replica watches, combining elegant style and cutting-edge technology, a variety of styles of replica rolex watches, the pointer walks between your exclusive taste style.